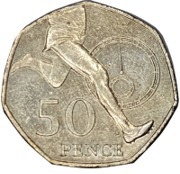 2004 was the 50th Anniversary of the famous race leading to the first four-minute mile by Roger Bannister. The legs of a running athlete with a stylised stopwatch in the background. Reverse designed by James Butler. Mintage: 9,032,500 (may include coins issued as part of a set). Minted at The Royal Mint.